Thumbnail gallery, trivia, top arcade music, and comparisons with enhanced pictures. See what Rainbow Islands could have looked like! 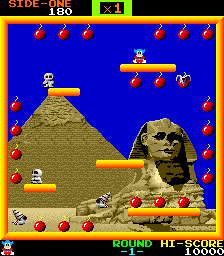 You might well have heard of these games anyway because they were converted to home computer and console formats such as the Amiga, C64, Spectrum, Amstrad, Atari ST, Megadrive and SNES amongst others. Take a look at the image section to the right. This gallery I have compiled shows approximately 80 different games - each chosen for their popularity, graphics, gameplay or a mix of these. See if you can recognise any of them. Also, you can click on any of the pics for a full scale version! The images shown represent only a small fraction of the total amount of games! There were thousands of others. Visit www.klov.com (Killer List of Videogames) for a complete list of all the games. Also visit Screenmania for hundreds of different games. very first game system I had was the Philips Videopac G7000 - a primitive machine, it nevertheless featured some playable titles. This was followed by the Mattel Intellivision, Commodore 16 and the rubber-keyed Spectrum =) Nostalgic times indeed. I still remember the atmosphere and wonder of games such as Treasure Island Dizzy, Motos, Manic Miner (Speccy), Xzap (very weird C16 game) and Dungeons and Dragons (Intellivision) at Christmas time. At this point I was hardly aware arcade games even existed! Later came the Commodore 64 (see the C64 page for the top C64 music!). Incorporating a sound chip superior to other systems of the time (and even the early Atari STs), it made computer-generated sound come alive! Technically proficient in-game music was easily implemented thanks to the strain being taken off the main processor. Anyway, it was around this era that I had my first glimpses of some of the coolest arcade games at that time. killer balloons from taking over the world... or something. 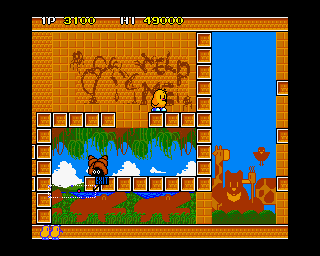 Probably the very first arcade game that I can remember was a game called 'Pang' (later, much to my delight, I was to learn that this would be a near-perfect conversion for the Amiga (in fact, the Amiga version was better in some ways!)). Set on a backdrop of some well-drawn famous locations, giant bubbles bounced around and you had to 'harpoon' them to make them split... and then split again (eventually vanishing altogether). Sounds simple, but looked great fun - I was in seventh heaven just watching someone else play it! - superfast and don't you just love those jumps? One other arcade also made a huge impression on me - STUN Runner. 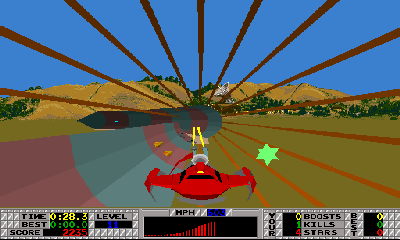 The speed was breathtaking and even to this day, the fastest PCs via emulation struggle to reproduce the pace of its unique 3D engine. For pictures of S.T.U.N runner inspired pictures, visit the Skytopia Tube Complex gallery. 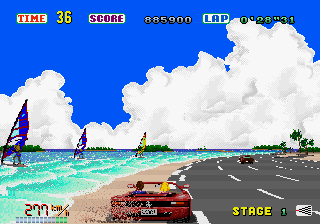 Another driving game that can't go left unmentioned is the classic - 'Outrun'. It was always such a frantic race against the clock to reach the next checkpoint - where you were rewarded with a change of scenery (day changes to night in 2 seconds - very 'unrealistic', but very cool). 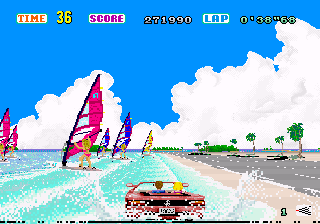 Featuring some of the best computer games music ever, Outrun gave you a choice of 3 tracks to listen to while playing. As a point of interest, the Saturn conversion ran at a frame-rate of 50/60 frames per second - making it smoother than the arcade (which I think only ran at half of that). Outrun. Sporting the latest in 'skim-o-matic' (tm) technology, the car will happily drive over water. Watch out yachts! Did you know? 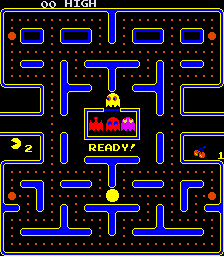 There are about 2,000 arcade games currently emulated by MAME - and over 3,000 if you include the various bootlegs. Over 500 known arcade games have still yet to be emulated by MAME as well (and many more than this if you include games with bugs). A pacman cartoon was derived from Pacman. 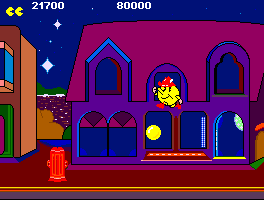 Afterwards, a Pac-land game was then derived from the cartoon! No wonder with such classics as Bubble Bobble, Wonderboy, Pacland, some cool overhead car games and a peculiar wireframe game that I have never seen since (space sorta game going into a web complex at the start I think - (not 'Star wars' btw)). 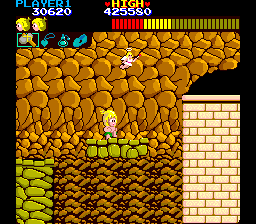 One go at Wonderboy and I was hooked. 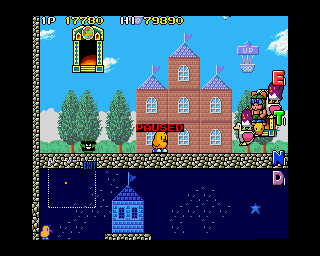 Brilliantly designed levels and a clever difficulty curve ensured I was to feed this arcade more coins than any other. 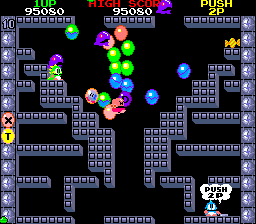 Then there was Bubble Bobble... Everything seemed amazing; bubbles were floating everywhere, bonuses seemed to pop out from nowhere! Waterfalls that took you from one end of the screen to the other - and that all-important feeling of 'what's around the corner' - it was a game-player's paradise. Did you know? Whilst thinking of a name for the main character, someone walked into the office and his name was "Mario". The rest is history. On asking, I was informed that the games had been moved to the bowling alley area, and that since the move, the older games were scrapped. No doubt to make way for the "latest gaming craze" such as Tekken 547, or some gimmicky �1-a-time ski game that's fun for about one go. You can also directly hear a few of the tunes listed below by going to this X68000 arcade music emulation page. 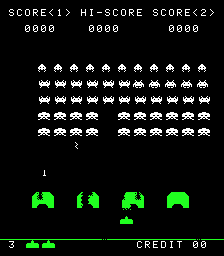 Quick fact 1: There was a major yen shortage in Japan when Space Invaders became popular. Quick fact 2: The concept of the pacman character was inspired by a sliced pizza! Quick fact 3: The one who made Gyruss then went on to create Streetfighter 2. Anyway, thanks to the wonders of modern technology and the effort and dedication of many people, emulators such as MAME have allowed us and a whole new generation of people to experience some of the best games ever made. Did you know? 'Vector' monitors build up their screens in an unusual way. Instead of a raster style refresh, objects and vectors are drawn in perfectly straight lines - no pixels whatsoever! 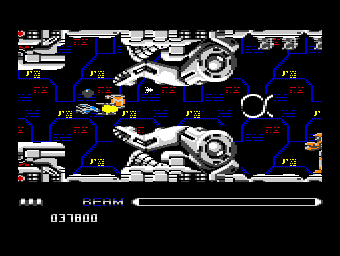 Some games which utilise the vector monitor are: Star Wars, and many Atari games. There are loads of guides, arcade ROMs, and reviews of all of these games on other sites, as well as competitions (you can even play arcade games online with other people) and tables of the best achievements! People regularly enter these and there's even a record book available at Twin Galaxies. 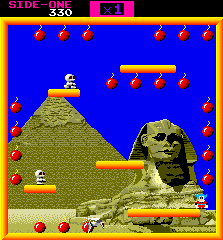 Visit the MAME action replay page or my own page here for the best high score achievements! Also visit Yesterday Land - A massive site dedicated to classic games, movies, toys and more. 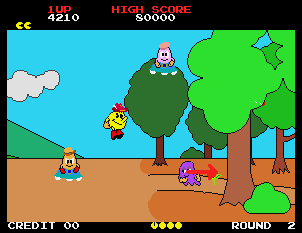 In particular, visit here to see people reminisce about the greatest arcade classics from the 80s. 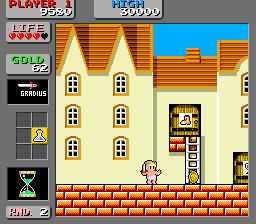 Games such as Rainbow Islands, Pac-land, Ghosts and Goblins, and Wonderboy have many levels missing in the home conversions. Games such as Commando, R-type, Ghouls and Ghosts, Bionic Commando, Ghosts and Goblins, Turbo Outrun and Super hang-on have better music on the C64 than the original arcade. Apart from Next Gen systems (e.g. 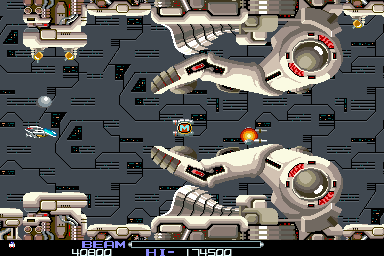 Sega Saturn and Playstation), the Amiga versions of 'Pang' and 'Toki' were possibly the only home conversions to be nigh-on perfect. Semi-near perfect conversions include 'Strider', 'Altered Beast (Megadrive).... 'Streetfighter 2', 'Smash TV', 'UN Squadron' (SNES), 'Klax' (Amiga) and R-Type (PC Engine). It's very rare, but sometimes the home conversions can actually improve on the arcade original. Examples include: 'Motos' (Spectrum) and 'Silkworm' (Amiga). Next up is a graphically illustrated guide to how the various versions of games compare. In a few cases, there are enhanced pics that even beat the arcade originals! 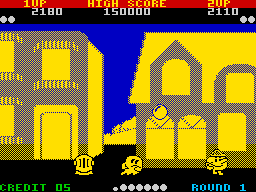 A typical example for say.... the game Pacland, could show in ascending order: Speccy, Amstrad, C64, Arcade and the all-new Enhanced version. On this page, you'll see only a few comparisons. Visit the Arcade Game Comparisons page for lot! (currently includes: Pacland, Bombjack, The New Zealand Story, Strider, Road Blasters, Donkey Kong, Bubble Bobble, Ghosts and Goblins, Ghouls and Ghosts, Midnight Resistance, Outrun, Rainbow Islands). A while back, my brother decided to take the original Rainbow Islands graphics and spruce them up a bit. 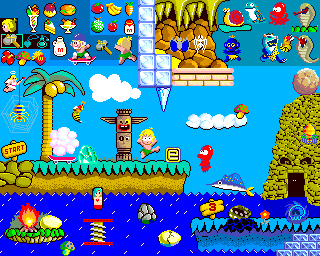 For those who don't know, Rainbow Islands was one of Taito's finest games - jam packed with bonuses, secrets, hidden levels, codes and creamy playability. The results are before you. 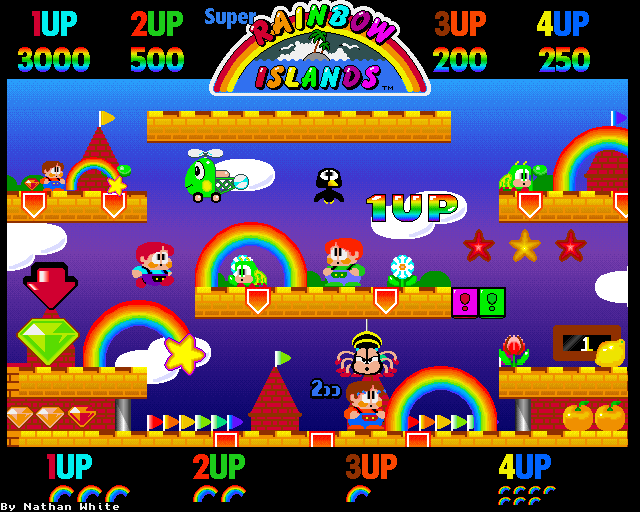 To the right is the original Rainbow Islands screen, which the new design was based upon. 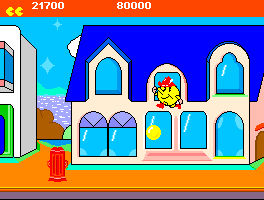 Based on the cartoon (which actually came /before/ the game), this unique platform side-scroller from Namco is one of the quirkiest games you could expect to play. 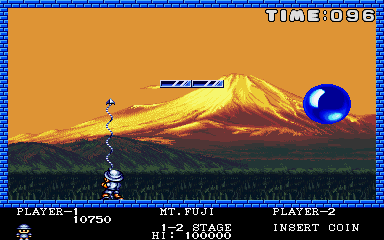 Unusual game design elements include the 'flying' trip (when you play the level in reverse), the music, foreground parallax, progressive difficulty structure and the ability to jump on enemies (the C64 version didn't allow for this). I have organised the different versions in order from worst to best and have included a couple of enhanced versions too! The humble Speccy version :) Monochrome, but what did you expect? Also, the screens 'jump' instead of scroll. The not bad C64 version. Looking similar to the arcade, except blockier of course. Fun to play, but missing vital sections from the arcade (only 5 levels) and there's no parallax scrolling. The original arcade version! I enjoyed the game so much in fact that I purchased the perfect conversion for Playstation (it was part of the Namco Museum vol. 4). A colourful game with equally colourful music and sound FX, this cool game from Tehkan was a hit in the arcades. It presented a great way of navigating; gravity did play its part, but was reduced (or increased) by repeatedly pressing one of the buttons. This made for some very interesting gameplay techniques. 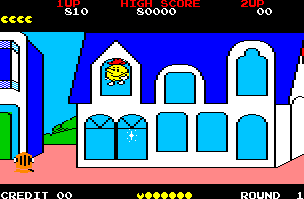 4 tunes accompany the various levels in the arcade version (this was reduced to just one in the home conversions). Look out for its sequel - "Bombjack Twin" - arcade only! 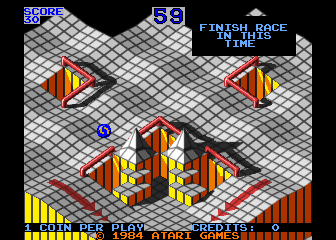 The C64 version. 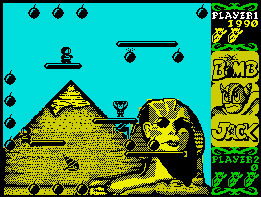 Actually worse in resolution than the speccy, this version also plays the worst. The Amstrad version. 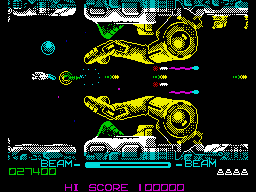 An 'interesting' colour scheme, and the resolution depth nearing the speccy version. 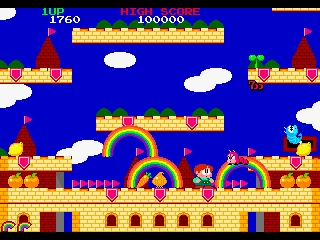 The Arcade version. The original and best. Click here for more Bombjack comparisons! One of the most addictive games ever made, this side scrolling platformer contains a very finely honed difficulty curve. Split into 4 areas over 7 stages, each level offers a different graphical style and its fair share of secrets. 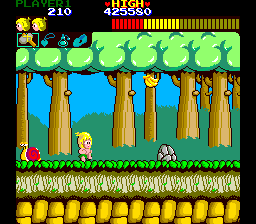 What made the game particularly frantic was the energy bar which can run very short - particularly on the 'Wonderboy Deluxe' ROM set. What I decided to do is compare the arcade original and C64 versions, but in an unusual way. Each picture contains a collage from all the levels. This way, you can see at a glance how the various graphics compare. Expect to see a collage for the NES, Master system and spectrum in the future. Click here for more 'Wonderboy' comparisons! "Dedicated to all maze fans" is the message that Taito say in the intro. I can see why. There are so many cool things about this cute platformer - from the multitude of bonuses and weapons, to the unusual ways of travelling (laser powered craft, airship (! ), to the various advantages certain balloons have over each other. (For example, some may be heavier and indestructible while the reverse in both cases is true for other balloons. Also, some are more manoeuvrable and/or smaller and thus less of a target)). The C64 version. OK, not bad, but just look at the decrease in screen height! the C64, the scrolling is also smoother too. Location .... Did you know the C64 version lacks some of the music in the main arcade ditty? area that's missing in all the home versions. Click here for more 'The New Zealand Story' comparisons! The legendary R-Type. This of course is the arcade version. See below for spectrum and C64 versions. The C64 version. Despite the poorer graphics, the sound is enhanced over the arcade version! Click here for more 'R-Type' comparisons! missed out your favourite arcade game/s or music? Visit Skytopia's Leisure Zone Forum. All feedback appreciated! "Actual in-game graphics may vary" - - - Article comparing arcade and home screenshots side by side. The Fundamentals of Fun - - - What makes a good game? Any graphics and text/reviews that are done by myself are copyright D. White 2002 onwards.